By replacing missing tooth roots, dental implants provide people with the strength and stability required to eat all the foods they love, without struggling to chew. Additionally, dental implants stimulate and maintain jaw bone, preventing bone loss and helping to maintain facial features. 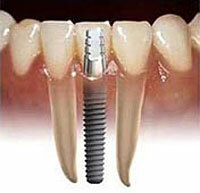 To determine if implants are right for you, a consultation with Dr. Drahota is needed. During this appointment, a thorough examination of your teeth and gums will be done. This may involve X-rays to ensure there is sufficient bone structure for placing the implant(s), and to determine exactly where the implant should be placed.